students are distrustful of the Labour leadership’s support for abolishing tuition fees and bringing back maintenance grants. ‘There are over a million undergraduates entitled to vote at this election and they are concentrated in certain constituencies. They are an important group of voters, but only if they choose to wield their power. This time, students have registered to vote in large numbers but they are less likely than the electorate as a whole to back the Conservatives. ‘An overall majority of students who have made up their mind support Jeremy Corbyn. But it is not a forgone conclusion that this will win Labour extra MPs on 8th June. This is partly because students want more information, partly because their vote could be more dispersed than usual and partly because many students are willing to vote tactically. ‘Given the strong support from students for the Remain side in the referendum and the centrality of Brexit at this election, it is most surprising that the Liberal Democrats have benefited so little from their unequivocal opposition to Brexit. They will have to work a lot harder to try and cleanse their brand of the damage inflicted by their volte face on student fees seven years ago, when most of the current undergraduate electorate was below voting age. Most students entitled to vote say they are registered to vote (93%), and only 5% are certain they are not registered. Registration is higher than might be expected, given recent changes to the electoral registration system and the peripatetic nature of many students’ lives. But there has been considerable media coverage of the issue, many efforts were made to encourage students to register prior to the Brexit referendum and Election Registration Officers, universities and students’ unions have worked hard to raise the registration rate. Most students plan to vote. When asked how likely they are to vote in the General Election on 8th June on a scale from 1 (‘Absolutely certain not to vote’) to 10 (‘absolutely certain to vote’), a big majority (82%) choose between 8 and 10, with 60% choosing the top option. The last three general elections have been held in early May, whereas the 2017 election is being held in June. This could mean more students will have returned home. Our poll suggests over two-thirds of students who plan to vote (68%) currently intend to do so in their home constituency and only one-quarter in their university constituency (25%). On the one hand, this could water down the impact that a concentrated block of students can have in marginal university seats. On the other, some students may live in seats that are more marginal when at home than when at university. Students are more likely to back Labour than any other party. 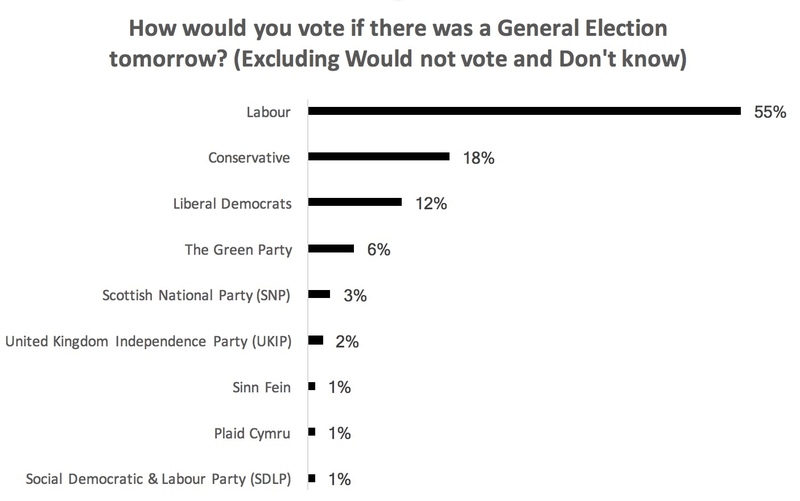 More than half (55%) of those who plan to vote say they would vote Labour in a General Election held ‘tomorrow’. Only one-in-six (18%) would vote Conservative. The Liberal Democrats, who were once the most popular party among students, have 12% support, higher than the Greens on 6%, the SNP on 3% and UKIP on 2%. There are differences in support for the two biggest parties by gender. While 61% of female students opt for Labour, fewer than half (47%) of male students do. Twice as many male students as female students express support for the Conservatives (25% versus 13%). Labour is more popular among students than in the lead up to the three last elections. The proportion of Labour-supporting students has more than doubled since April 2005.
in April 2015, 35% backed Labour. Students express distrust of politicians, with only 9% agreeing that politicians have their ‘best interest at heart’ and 49% disagreeing. Jeremy Corbyn has a net favourability score of plus 29. Tim Farron has a net favourability score of minus 10. Theresa May has a net favourability score of minus 33. Jeremy Corbyn and Tim Farron have higher favourability ratings than their predecessors. While Theresa May is expected to do better in many areas of the country than David Cameron, among students she is less popular, scoring a lower rating than her predecessor. When asked to pick their top three issues facing the country at the moment from a list, a clear sense of students’ priorities emerges. The EU and the NHS come above all other areas of concern, with two-thirds (66%) of all students opting for each one. Education (30%), jobs (24%) and the economy (22%) come next on the list, above terrorism (17%), housing (16%), immigration (14%) and the environment (13%). Languishing towards the bottom are ‘ageing populations’ on 6% and ‘personal debt’ at 4%, which may suggest students are less worried about indebtedness than is often supposed, as well as crime (4%), defence (3%) and international development (2%). Brexit is set to be a factor in students’ voting decisions. Almost three-quarters of those who are likely to vote (72%) say it will affect their vote (23% ‘strongly’ and 49% ‘to some extent’). A majority (62%) of those who say Brexit is a factor are likely to support a party because it opposes Brexit and only 15% because it supports Brexit. There has been talk of a progressive alliance in individual constituencies, an increase in tactical voting and deals between parties to help sway the results. Many students are open to the idea of voting tactically: 53% of students who plan to vote and who say their vote could be swayed by Brexit express some support for the idea (which is 31% of all students) and only 16% rule it out (which is 10% of all students). Students are split on whether an early election should have been called, with 43% agreeing it should, 33% disagreeing and 24% uncertain. Now that it is happening, however, they have an appetite for accessible information. Most are in favour of a TV leaders’ debate, with 86% wanting one and only 7% opposing the idea (with 6% uncertain). Conservative-supporting students are less likely to support a TV debate, but a substantial majority of them would like one (71%). Two-thirds of students (67%) would find it useful to have information about the Election from their representative body, the National Union of Students, while only 14% say they would not find this useful. Labour are regarded as the best party for students by 40% of respondents (44% of female students and 36% of male students). Even 18% of Conservative voters and 27% of Liberal Democrat voters regard Labour as the best party for students, suggesting these voters are choosing other reasons to support their preferred party. Although the Green Party has sometimes done well among students (for example, at the 2014 European Parliament elections), only 10% regard them as the best party for students. Yet this still puts them in second place behind Labour. Moreover, the Green Party confirmed a student-friendly set of policies – including abolishing tuition fees and bringing back maintenance grants – after the poll had been undertaken, while the Labour Party are not expected to confirm their policies for students until their party manifesto appears. The Liberal Democrats’ decision to oppose tuition fees at the 2010 General Election and then to back an increase to £9,000 in office afterwards was fiercely opposed by student representatives. Today’s undergraduates were still typically at secondary school when it happened while the undergraduates of the time have moved on. But the impact lingers. More than half of students planning to vote (53%) say it is a factor in deciding which party to vote for in 2017 and only a quarter (26%) say it is not. The Labour Party’s leaders, including Jeremy Corbyn and John McDonnell, have said they wish to abolish tuition fees and reintroduce maintenance grants. It remains uncertain if their manifesto will repeat this pledge. When asked, Gordon Marsden, Shadow Minister for Higher Education, Further Education and Skills, only confirmed the reintroduction of maintenance grants at a HEPI event on 27th April. one-in-seven (15%) students is ‘not sure’. Among Labour-supporting students only, just under half (48%) expect them to follow through, while a mere 15% of Conservative-supporting students expect them to do so. One unknown is whether a failure to follow through would have the same detrimental impact on Labour support as it has had in recent years on support for the Liberal Democrats. Wave 3 of the HEPI / YouthSight Monitor was conducted between 24 and 26 April 2017 among 1,016 full-time undergraduate students. The online poll was undertaken using YouthSight’s OpinionPanel Community, which has been built up in partnership with UCAS. Respondents received a £1 Amazon gift voucher and the results have been weighted. Wave 2 of the HEPI / YouthSight Monitor provided the first detailed findings on what students think about various free speech issues and was published in May 2016, while Wave 1 provided the first robust study of students’ views towards Brexit and appeared in November 2015. HEPI’s two previous papers on the impact of students in General Elections are still available: Do students swing elections? Registration, turnout and voting behaviour among full-time students by Stephen Fisher and Nick Hillman (December 2014); and Students and the 2015 general election: Did they make a difference? by Nick Hillman (October 2015).